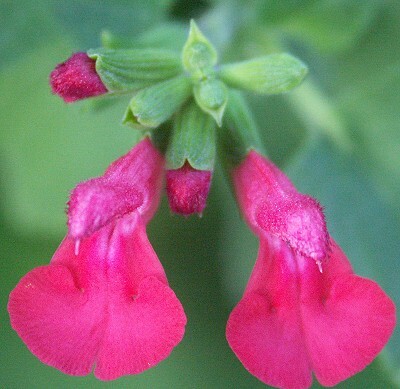 Whether this plant was named for the vibrant watermelon pink color of the flower or the fruity fragrance of the leaves, Wild Watermelon Salvia is sure to enhance any garden. Its flowers can be used as an edible garnish, if you can bring yourself to deprive the hummingbirds. The vibrant greens and pinks provide just the right contrast to the grays and light purples of lavenders like Provence Lavender. This a lovely early spring blooming combination. However, when the Provence Lavender is finished flowering the Wild Watermelon Salvia will just keep on blooming. Wild Watermelon can get up to four feet tall and four feet wide. It can be pruned anytime it gets out of shape. We normally prune to about a foot all around in mid- summer and then again in mid-fall. 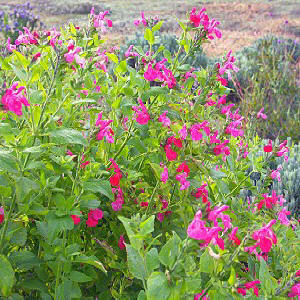 Wild Watermelon Salvia is one of the six plants chosen to be in our Kid's Herb Garden Six Pack. This plant is sometimes available in plug trays. These trays hold 128 of all the same plant. They are a great low cost way to fill a lot of space. Each cell is 3/4 of inch by an inch. Check here to see if Wild Watermelon Salvia Plug Trays are available.